Based on the immensely popular card game, Munchkin comes to comics! 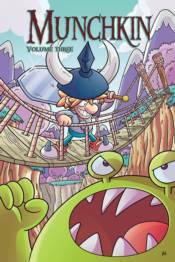 Taking place in a very flexible mash-up of genres, Munchkin collects stories from the world of the fantasy role-playing satire. What do Munchkins do? They play for the win. They are rules lawyers. They backstab. They gloat. They whine when someone else backstabs or gloats. Collects issue #9-12.